The Federal Motor Carrier Safety Administration (FMCSA) discussed crash fatalities related to large trucks and buses in a November webinar examining the deaths of bicyclists and pedestrians in truck and bus accidents. The webinar was in support of U.S. Transportation Secretary Anthony Foxx’s “Mayors’ Challenge for Safer People and Safer Streets” effort. The effort challenges mayors across the country to look for ways to improve bicyclist and pedestrian safety on city streets. Highlighted in the webinar was information from the FMCSA’s most recent study about collision fatalities. The data shows that heavy trucks and buses are overrepresented in collisions. For the year 2013, approximately 4 percent of registered vehicles were heavy trucks and buses and they accounted for 9 percent of total miles driven, but the vehicles were involved in 13 percent of traffic accidents and 13 percent of overall traffic fatalities. 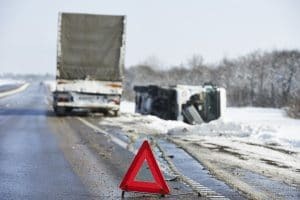 FMCSA Chief Safety Officer Jack Van Steenburg presented data showing that in 2013, there were 3,806 accidents across the country involving a large truck or bus and those accidents killed 4,251 people. Of those killed, 739 were riding in the trucks or buses. The majority killed were in passenger vehicles, on motorcycles or bicycles, or pedestrians. Seventy-eight bicyclists and 338 pedestrians were killed. The bicyclist and pedestrian deaths show an increase of 39 and 30 percent respectively since 2009. What is being done to reduce accidents and fatalities? FMCSA is developing recommendations for a bicyclist and pedestrian safety training program for people getting their commercial drivers’ licenses. The organization also offers grants to cities for roadway projects to improve bicyclist and pedestrian safety. A couple of suggestions for improving safety include separating motorized and non-motorized traffic and better markings on roadways to distinguish between areas for motorized and non-motorized traffic. The organization also provides large truck and bus traffic enforcement training for law enforcement officers, who it says are often reluctant to stop the vehicles for traffic violations. FMCSA offers two smartphone applications for checking safety records of trucking and bus companies. The QC Mobile and SaferBus applications can be downloaded by visiting www.fmcsa.dot.gov.